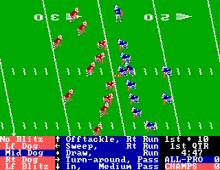 One of the earliest American football games to boast player animations, 4th and Inches is one of the first football games to offer a good blend of action and in-game strategies. You can throw the bomb, run the sweep, call the blitz, and exercise other common tactics in the game. The lack of detailed statistics and typically fast matches make this a good diversion from more realistic football games. The game's highlights are player substitutions, a good range of play selections, and fast action. The rare but superb Team Construction Disk add-on which you can download from this site makes a fun game even better: being able to edit team names and colors take the monotony of playing the same two teams away somewhat ;) Worth a look for football fans.